The CCD Array Reader project began with a free sample of the Texas Instruments TC102-1 CCD Linear Image Sensor and its rather terse data sheet. The TC102-1 provides virtually no support circuitry, only the raw CCD (with a few special pixels) and a simple output buffer. 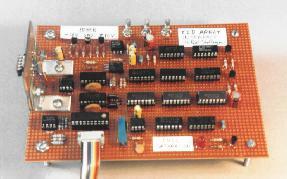 The board shown below was designed to continously scan the TC102-1 and output a stream of digital data in parallel format. A PC computer displays the data graphically using a simple program. Please Note: the TC102-1 is now an ancient component. This design was completed in approximately two weeks in the Winter of 1992 as a student project for a Physics course I took. Much better chips than the TC102-1 are now available, but parts of this design may still be interesting. Many people who arrive at this page are interested in building a camera-style project. If that's you, the good news is that newer CMOS-based parts are now available that are much easier to use than CCDs and usually contain a lot of the hard-to-build support circuits (like this project) on the chip because of the CMOS process. A cool chip, which I have personally seen in operation, is the LM9627 Color Image Sensor Chip, 648 x 488 Pixel, 30 fps. This is a very modern part that will be a lot easier to use than a really primitive part like the ancient TC102-1. 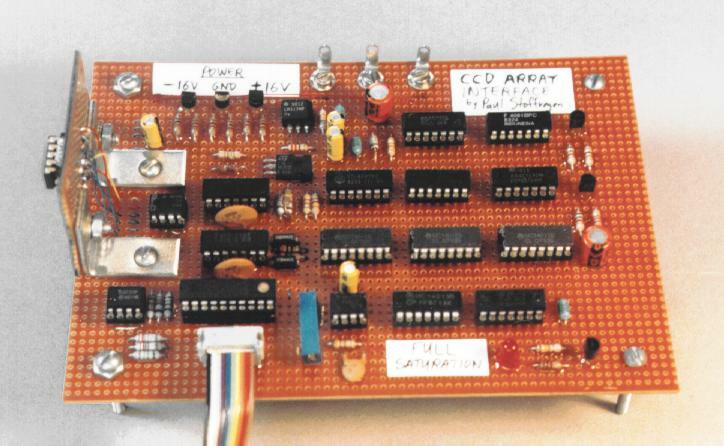 I have not worked with other (newer) CCD array devices since this old project in 1992. Saturation Detect indicates when the array is exposed to too much total light.